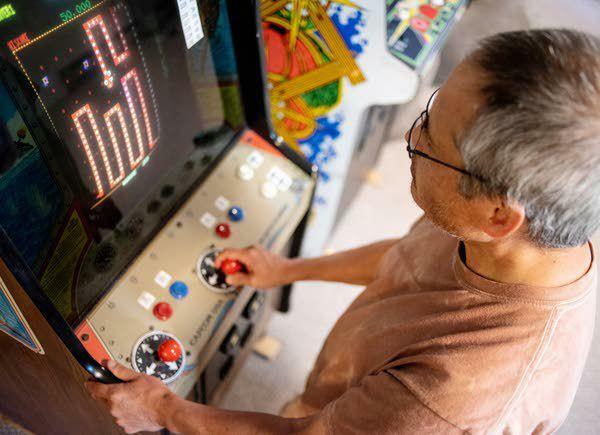 Thu., May 24, 2018, 8:42 a.m.
Tom Asaki flicked a 1980s arcade machine joystick back and forth in the basement of his Genesee home, his hand strategically guiding a red snake through a maze as the machine beeped and booped in the background. The game: a Pac-Man-esque, yet obscure, 1982 Rock-Ola release called Nibbler. The goal: consume all the food in the maze without letting the snake run into its own tail. The film, now on Netflix, takes an in-depth look at some of the best Nibbler players in the world, including Asaki, who said he was interviewed for the documentary about nine years ago on the WSU campus. Asaki made headlines in May 1983 when he became the first recorded person to attempt to earn a billion points on Nibbler. There, at the Twin Galaxies arcade in Ottumwa, Iowa, Asaki encountered the not-yet Nibbler champion, Tim McVey, who reportedly vowed to beat whatever score Asaki achieved that day. Asaki fell short of his attempt, earning just 838,322,160 points, and McVey fulfilled his promise to beat the score months later, becoming the first person to earn a billion points on Nibbler in January 1984. This year, more than 35 years after his first attempt and years after the filming and release of the documentary, Asaki finally achieved his goal of breaking a billion points at a March competition in a Santa Fe, N.M., arcade, a feat he completed in just 36 hours. The timespan likely makes Asaki the fastest person to reach a billion points, and the oldest, according to Asaki, who has also made a name for himself in the world of Ms. Pac-Man, his first draw to the arcade scene as a young man. Preparing for game day was no small feat. Considering how much time it takes to accomplish a billion points, “you don’t exactly just decide to do it willy-nilly one day,” Asaki said. After hearing about the competition in Santa Fe, Asaki began considering what his diet would entail, choosing to consume raw vegetables and a sandwich over the course of his gameplay. Preparing the retro machine to work properly also took some work. Asaki’s wife, Heather Moon, said her husband faced a couple scares throughout the game, including a faulty joystick and apparent malfunctions as Asaki reached the 900 million point range, sparking Moon and others to move the machine and place a fan behind it to keep it from overheating. Sleep is not an option for players, though the way the game works, players can choose to take miniscule breaks in between the hours-long action. They accumulate buffer “lives” throughout their gameplay, but may only accumulate 128 lives before the count rolls over and the game inexplicably restarts, giving them the ability to accumulate lives and then lose them consecutively while they hit the bathroom. Asaki recalled his vision becoming impaired and traces of hallucinations beginning to stir in his mind as he neared the billion point mark. At times, he said, he considered ending it all on purpose, his will to play staggering as the hours carried on. Knowing he would make it by the time he reached 985 million, Asaki reached a billion, stepping away almost immediately after to hug his wife, he said. Despite having enough lives to continue playing, Asaki said he was satisfied having accomplished what he set out to do. The cabinet he played on remains in Santa Fe, now including his signature, a copy of his score, 1,000,005,090 points and the date, March 30-31, 2018, in black marker on the screen. Asaki said he brings up the story to some of his students, but otherwise keeps quiet about the unique success. His wife, on the other hand, said there have been times she enjoyed bragging about Asaki’s accomplishment. Published: May 24, 2018, 8:42 a.m.